Map showing location of Maruia Springs Thermal Resort . Use the controls on the map to zoom in and out. 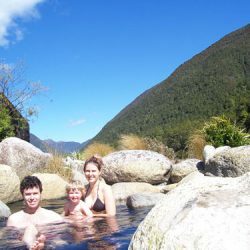 My partner and I (and our 4 month old twins) stayed at Maruia hot spring for 3 nights at the end of 6 weeks travelling around NZ. We had an amazing stay, the staff are all lovely and very accommodating. We are big fans of natural baths and these are completely natural. They do have an algae that forms from the mixing of the thermal and cold springs but it feels great to rub on your skin and can apparently be eaten (like spirulina) so isn’t a problem. There are three different outdoor pools with varying temperatures and one indoor but all were around 39/40 degrees when we were there. The dry sauna and steam are great and the new Infrared sauna works really well. We started every day with an infrared sauna followed by jumping in the fresh cold water spring pool which we would thoroughly recommend before breakfast. All the food we had was excellent with a focus on being very healthy (fermented foods etc). We did the room/breakfast/dinner package and would recommend it as a treat! The one down side is that there are lots of sand flies but they give out a free oil that really works so they didn’t bother us and the babies didn’t get a single bite! If you fancy splashing out on a quality pool this one is highly recommended. On the opposite end my other favourite was ngawha springs in the north (also completely natural with lots of different muds). It's a real shame that the segregated Japanese Bathhouse is no longer the same under the new owners. It used to be so relaxing and traditional. Prices are a bit steep too now. I have been here many times over the years and often stopped en-route to or from Christchurch but in January called to find new owners and new prices, $40 per person. No more visits at that price. Unfortunately the springs were not to what you would expect. One was closed for cleaning, which if it was anything like the one left open was in desperate need of it. One would expect algae with natural springs, one would not expect to lose sight of your feet within said algae. There was clearly a slip mat there once upon a time, no longer, and the one "safety rail" was rickety and would potentially cause more harm then good. We stopped there on a cycle ride from Chch to Nelson back in 1978.Then it was just a hotel and a concrete hot pool;the water was piped across the river from the actual spring on the right bank.You carried your jug of DB down to the pool'stuck it into the 6" of snow around the edge and dipped-for free.They even let us crash for the nite in the changing rooms. Sounds like times have changed. Natural hot pools beautiful setting, no chlorine :) Hot concrete floor in changing rooms (lovely) Does have black algae - very natural and shows pools are not chlorinated. Lovely service. We are lucky to have these Japanese pools here in NZ I will come here again and again. A beautiful place to stop and enjoy a soak. We were on honeymoon and stopped in for the night. It was really enjoyable to sit an relax in the natural setting. I couldn't believe the scenery was so nice. While lazing in the pool with my head resting back I lay there looking straight up to snow covered mountains just across the valley. The location is beautiful, the one night stay was awesome it was simple and had really good customer service the food was really good, but we made the mistake to order too much and unfortunately couldn't finish it. the stay overall was very basic and very relaxing, we will defiantly visit again. Sublime. Perfect for adults wanting to get away from the everyday. Not cheap but a wonderfully peaceful experience, just the two of us sitting in the outdoor rock pool enjoying the sunset on the snowy peaks, then the stars and the moon. Very special. excellent. had a great time. Pleasent staff . nice and quiet lovely setting. We will be back. Spent one night at the springs March 16th 2013. The staff running the place were very friendly. The pools were nice at 40 deg C. The reception area was nice. The restaurant was very nice and the meals reasonably priced. The accommodation however was a shocker. At $179 a night for 2 star accommodation was not acceptable. Poorly maintained, a bit on the grubby side I couldnt wait to get out of the place. 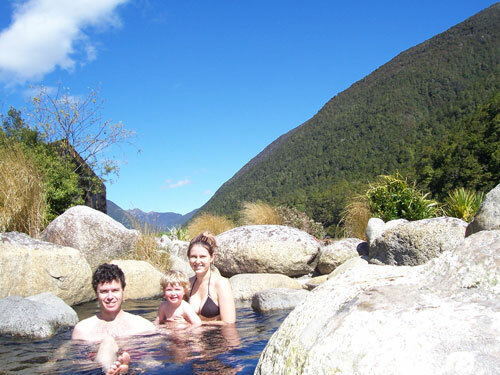 We have been regular visitors to the Maruia Hot Springs over the last 20 years. We have not been for the last 2 years due to circumstances (we have been badly affected by the Chch earthquakes). We made a special effort to take my father, who is visiting from the UK. Our visit on (27.01.13) was more than disappointing. I have to say I was disgusted with the state of the pools and facilities. Weeds and filth abound. The grounds were overgrown and generally unkempt. The shower facilities were dirty and the floor was covered in slippery mud deposits. Dead flies and spiders hung from cobwebs on the shower roof that was cracked and obviously rotting in places. I should imagine that the floor was a result of the excess sediment in the pools. I realise that these are natural springs and that a certain amount of natural matter is present in the water but the pools were a mass of slimy "seaweed" type floaties and at 39 degrees were almost unbearable. It does nothing to enhance your relaxing experience when you are surrounded by lumps of sediment, one of which was so big it looked like a dead cat floating in the pool. Surely removing the larger deposits with a pool net would not be too hard. I don't think pulling out a few weeds and some general maintenance would be too hard. The $19 entry fee per peson should more than pay for maintenance. I won't be visiting again . I have not been to Maruia Springs, but have been reading this page as part of my own personal investigation of places to visit in the South Island. I just want to say that I find the variety and range of comments helpful as, unlike those contributors here who claim that honest reviews that do not simply gush about a place is 'whinging', I appreciate that the concept of a review means that ALL aspects and experiences must be included, even the negative ones, otherwise it is not a true review. The person who says that 'if you have nothing nice to say then don't say it', seems to have missed that point. A mature person understands that refusing to accept an honest account simply because you yourself didn't have that experience is hardly conducive to providing a realistic assessment of a place. If someone has had a negative experience then it is just as valid and just as much simply a statement of fact as someone who has had a very positive experience. For those who are affronted by those who have had different experiences to them and having the honesty to say so, I wonder if the complainers of the complainers went on the same day at the same time, slept in exactly the same room, was attended to by exactly the same person, etc., etc.? Of course not. So how would they know that the reviews that recount a less-than-positive experience do not have some merit? Would I come to Maruia Springs, even after reading the cons as well as the pros? Yes, I would, and I am definitely planning to do so. As an intelligent and educated person, I am quite capable of taking into account that some people make mountains out of molehills, but I also realise and accept that negative experiences genuinely do happen. However, I will be able to select which times are better to go, whether I want to actually stay in one of the rooms or spend the money on extra hours in a pool, whether I want to dine in the restaurant, or whether I would prefer to have a picnic lunch somewhere, etc, etc, thereby ensuring that my stay is far more likely to be a pleasant one, due to the fact that I have been able to read about the 'minuses', as well as the 'pluses'. I will also be able to advise others contemplating a trip, so that they get the best out of their experience and therefore will want to recommend the springs to others. If I personally don't encounter any of the negative experiences that others have had, then well and good. But forewarned is forearmed, as they say, which I can't be if reviews are simply 'nice' when 'nice' is not the only experience people have had. The Dinner meal was awesome and the service was very helpful but unfortunately I was dissappointed with my room at $159 I expected something more than 2 1/2 stars. The ladies bath house was nice and relaxing. So go for dinner but stay else where. We recently escaped Christchurch for a night away at Mauria. We arrived early, thinking we could use the pools until 3 when check in was scheduled. When arriving at 9am, the room was available, and we were given the keys straight away! Everyone was so friendly and happy to help. The private spa's were incredible, with windows you could open looking out onto the lightly snow covered mountains and river. The Japanese room was a highlight, as was the amazing massage we both had. Both my partner and I couldn't talk higher of the food, especially dinner, well presented, great portions and fabulous tasting food! Ate far too much, but couldn't resist. 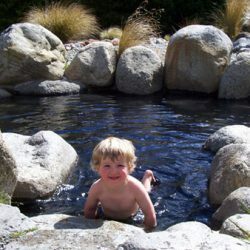 The outdoor thermal pools were so much more peaceful and private than some other thermal pool resorts in the South Island, and having them available 24 horus a day was ideal. Thankyou so much Mauria for such a wonderful experience, we will definately be back! I'm a tramper and used to leave my car in their car park for a small charge, while I went tramping. However, I just got told over the phone they no longer allow this. That seems distinctly unfriendly, so I'm not inclined to want to stay at the resort itself in future. It is a nice place after all. Expensive to stay, not much to do besides the excellent thermal pools. Miles better than Hanmer Springs which is a bitter disappointment. Our room ($339 - room 10 of Garden View) leaked shower water from the room above via a sagging water damaged ceiling - we had to move the bed and set up a cup to catch it. We reported it to Management who said they couldn't see it (apparently went into our room while we were eating) then blamed us as it was our friend's in Room 2 above who were using the showers! There was no hot water at all - not in the unit, the bath house or the changing rooms. First we were told it had run out but when pressed as to how long before it recovered they admitted it was "a little bit broken". In 2 hours playing cards in the room we chased 5 mice - most vanished into our bed bases then kept us awake all night in and out of our gear. The entire complex excluding the restaurant (which was surprisingly good) was run down and a health hazard, not to mention overpriced. Very disappointing, especially the rude and dishonest management. We booked a two night stay at Maruia springs for a quiet, romantic getaway. I am amazed at some of the negative comments here, especially from some of the people who have only ever placed one comment, and it is negative. Nothing nice to say? Say nothing at all is my motto. Our experience was exactly what we wanted. We were not scabby with getting the cheapest room in the joint â€“ we opted for the â€˜eco packageâ€™ which saved us some money on the better quality rooms. Room was very nice, quite spacious and the heating worked very well. We noticed there was a wall heater in the bedroom, another in the bathroom and a spare small fan heater in the wardrobe â€“ needless to say we were not cold. Our room was soooo quiet; we did not hear a peep from anyone or any other room. The whether was dreadful â€“ we knew it was going to be prior to booking the night before, but we still did. Snow to ground was predicted and true to form, it did, in amongst unrelenting rain and a very cold snap of about 2 degreesâ€¦ This made for a very cosy and romantic 2 nights and days in, doing a whole lot of nothingâ€¦ exactly what we signed up for. There is no TV. There is no radio. Internet is unreliable as it is satellite as is the phoneâ€¦ This is clearly on their website. The hot pools are at the demands of the environment and the elements and out of the control of the operators â€“ we found them very nice during our stay, the outside one was very hot and we could not stay in too long. The indoor one was perfect and quiet. Dinner at the restaurant was great. Both nights they had a constant flow of tables and the service was great. We ordered the hot pot â€“ was great. We stuffed ourselves the first night, determined to finish it â€“ the broth was something else. Was so good that we had it the next night too but were not quite able to finish it this time. I can not imagine someone who goes to a Japanese restaurant and orders Lamb Shanks â€“ can someone explain that to me? We have been to the springs before and we noticed that the restaurant and the rooms have been done up â€“ very nice, neat and tidy. Oh â€“ one very bad mishap â€“ ordered a Panini in the CafÃ© the first day and I was forgottenâ€¦ Once they realized their mistake, the apologized, corrected it quickly and offered both my wife and I two free coffees, gratisâ€¦ We declined as the apology was heartfelt, genuine and was all that was required really. All-in-all, a wonderful getaway and was everything that we were expecting and wanted. We will return and we do recommend to many travelers who want a genuine experience. Friendly staff. Clean facilities. Awesome rock pool. Lovely place, If you are a winger like the one below.. don't go to Mauria spring.. Its the best place on earth!! A very disappointing weekend. Friday 11 and Saturday 12 July 2008. Arrived to uncleared driveway covered in snow. Checkin was polite but no help was offered in carrying bags through snow to the room as you couldn't drive any further than main reception it was quite a 'haul' to the Mountain Veiw units. The pools were just warm on the Friday night but the Utase-yu...waterfall was cold, not hot as it states in the maruia web site description. The meal in the restaurant was pleasant even though the open fire did little to warm the air. The food was tasty and well presented on the Friday night. The unit was basic, generally clean except for the very dirty skirting board surrounding the whole bathroom. Not only did it appear to not have been cleaned for a long time but the towel rail positon meant that your towels would hang over the dirty ledge! I also noted that the wall beside the toilet had splashes over it...another obvious that it hadn't been thoroughly cleaned. Now onto the Saturday...yes we had a pleasant continental breakfast again in barely warm surroundings in the main building followed by a day of total lazing around reading as the rain continued to pour down constantly, and we had a very nice massage. We actually booked another for Sunday morning before we hit the road (we cancelled that though after the following disappointments). Another pleasant dinner on the Saturday night but service this time was poor with the waitress forgetting to bring one of the dishes. Off we went then to have an evening session in the pools. We hadn't used them during the day with the rain coming down so hard. The pools were VERY COLD! Couldn't stay in long at all so we went to the Bath House...only to find the womans inside door wouldn't open..no luck getting in there. The mens was...barely warm again and the water from the showers was cold too! Forget their 'traditions' you have to get something for your money..so my lady came into the mens for about 10 minutes of luke warm natural waters (there was no-one else in there...we know why..because it wasnt very relaxing). Oh well, back to the warm unit to have wine from the little 'juice' glasses that are provided for your drinking pleasure...no, expensive wine just isn't the same from a kiddies glass! Bed was comfy, just as well because we got up in the morning to no hot water in the unit at all...ok so there was a jug for coffee making...just as well that we could boil it and add to the little bathroom sink to have a good old victorian sponge bath! We told management about the water problem and while we had breakfast we assumed it would be fixed...but no such luck. So our bags were packed, the massage cancelled and the bill sorted. The bill, well again it was unpleasant to find that we had been charged for a 'package' weekend twice but due to our hassles they would discount one! That's hardly called a discount. More negotiating found that we were charged considerably more for the massage we had each, we finally got the charges sorted and a discount for the lack of using the pools and unable to shower! Other problems noted...hazards everywhere..power cords through walkways, a transformer directly outside the most commonly used door to the main building sheltered from the rain by an umbrella!, signs that were incorrect, heaters in units undersized to cope with the weather, services not available in several areas, no kitchen cloth or tea towels for cleaning up the coffee bench in unit...am I supposed to use my facecloth to wipe and dry my coffee cup??? The website says the unit standards include a dining table and chairs...I didn't see any...nor was there even a plate or knife to dine with! All the kitchen unit had was 2 coffee cups, 2 little glasses, 2 tsps, fly spray and a rubbish bin...oh and a fridge that we had to prop the front up so our wine bottles didn't roll out when you opened the door. On returning, I got on the web site to see just what inspired me to book into this 'resort' in the first place...only to discover so many misleading statements. Not to mention that the package we were given but not actually what I booked included private spa time...that wasn't even mentioned to us during our stay...the 3 course meal...well again when we ordered that wasn't mentioned. We thought we were paying for everying individually and only had mains and a side dish...yet we were put under a 3 course package? Obviously this is a very badly run destination that we won't be returning to nor recommending. TARGET on TV would have a wonderful time picking on this place. Really nice. After walking the St. James track we went to the resort and it was bliss. We had NO sandflies (winter, May) and we were the only people in the public pools. I prefer these natural pools to the crowded, commercial Hanmer and the snowy mountain view is just grand. The only tiny negative I had was the shower temperature in the Japanese bath-house; it was warm enough to comfortable shower but after the toasty hot pool I'd been in, I would have liked it hotter. LOCATED ON THE WEST COAST NOT MARLBOROUGH!!! Best spot, quiet, no crowds. A fantastic find. After reading the lengthy and intensely negative review I feel compelled to defend Maruia. I spent a lovely afternoon there in December. It was charming. The smiling staff were very friendly and helpful. The pools were more natural when compared to Hanmer and had so much more character. My lover and I found it was a very romantic experience and we long to return together to rent a private bath in the winter someday. As for the sandflies, they seem to be a South Island/New Zealand wide phenomenon, not exclusive to Maruia. These less commercialized, laid back pools are a gem. I have watched the condition of this pool complex decline over the years, while conversely Hanmer Springs has improved greatly (admittedly they have far more resources so you can't really compare). However the setting of Maruia Springs is wonderful and the Japanese bath-house is unique in NZ and has large window overlooking the river and mountains. Not up to its usual standards recently (early January '08). Pool water was black with algae floating it it (may be caused by environmental conditions rather than a lack of cleaning), some pools only lukewarm, and water pressure of showers much weaker than usual. Worth going if you haven't been before though. Winter possibly the best time to go (e.g. less sandflies). We had a wonderful weekend away at Maruia Springs. Having never been there before, it turned out to be everything we hoped it would be and more. The pools were wonderful (and open 24hrs! for in-house guests), the accommodation warm and comfortable, and the staff very helpful. We'll definitely be going back! 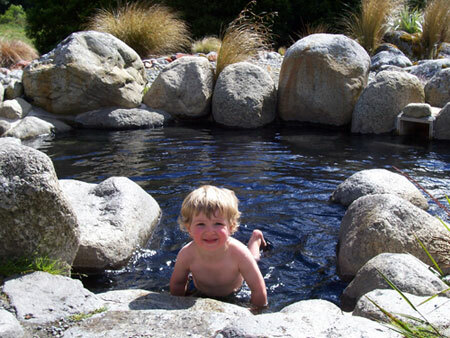 The high naturalistic standard of these pools makes many other commercial pools in NZ look cheap and nasty. No tv screens or talkback blaring. Beware the sandflies,if you squash any they follow the pheromones and hunt you down. The bar could do with some organic beer from Westport. Stunning location. After two long years of hard graft we were looking forward to a relaxing holiday which included Maruia Thermal Resort............BIG, BIG MISTAKE. At a distance the resort looks great including their website pics. but at a closer look the upkeep of the accomodation is appalling. Our chalet (no.5) was cramped and in need of some basic TLC. The wash basin was cracked and crazed and totally unhygenic, so was the toilet unhygenic, which was badly stained beneath the water line. The paintwork on the woodwork was second rate, but the price of the accomodation wasn't, they are asking five star rates for two star service. The shower unit is woefully small, so if you are a little on the large side you will be constantly knocking the water control off or knocking the water either onto hot or cold. The service in their resteraunt has little to be desired too, being the only eatery for miles around you are at their mercy! There were four of us for dinner, two of our main course orders arrived before the starter, which finally arrived ten minutes later with the waitress stating "It went to the wrong table, no worries", then TWENTY FIVE minutes later the other two main courses arrived. There was no management available to talk to until the morning of the next day, and when informed that one of the owners was on site and we asked to see her, she didn't want to see us! We eventually were recompensed 10% (the price of the starter!) and offered a voucher of $60.00 to use for a free spa at the resort!! We fully recommend that anybody wanting to unwide and relax at the Maruia Springs Thermal Resort NOT to waste their money and time there but to go to Hamner instead, which by the way has no sand flies that are ready to attack you the moment you are in the open! PS. Be warned, if you do risk going to the resort, the rocks that lead to the pools are very, very slippery. Yes I am a conisour of thermal water and Maruia is extremely good. My only compliant is the sandflys, they are enormous and very hungry. Best hot spring on NZ. Wonderful Japanese experience. The best hot springs and traditional bath house we have found in New Zealand. Just like being back in Japan. Absolute Bliss. Is this the best hot spring in NZ? I think so. First time there we arrived almost by accident - it was snowing and we were thinking, how are we going to cross Lewis Pass? We saw the springs and checked into a room - then sat outside having a hot soal as the snowflakes fell around us. Gorgeous. Loved the Japanese Bath House also - the luxury of sploshing around in hot water as you look out over the mountains. Mwah! Why anyone bothers wilth Hamner Springs when they could have Maruia is beyond me. Fantastic mountain scenery, almost halfway to the coast and great japanese indoor bathouse. Utterly spectacular setting. We sat in the various pools in the middle of a misty winter day and looked around at a rather freezing day, warmed both by the water and the surroundings. We had been at Hamner the night before, with the masses, which was barely enjoyable. We were passing Maruia, didn't know it was there, stopped to have a look, and spent the entire afternoon there.